Thanks for your interest in research at PatientsLikeMe! Our Research team is responsible for the science behind developing new features on the website, designing new communities, maintaining the quality of our data, and carrying out research work for our clients and collaborators. How can I participate in research at PatientsLikeMe? I have a research idea. Where do I talk about it? I have registered as a Researcher on PatientsLikeMe. What am I allowed to do? I have a research proposal I think would interest PatientsLikeMe. Whom do I contact? How do I obtain qualitative and/or quantitative patient data from your website? How can I use PatientsLikeMe to help recruit patients to my study? I would like to obtain one of your measures for use in my study. What is the procedure for doing this? Can PatientsLikeMe help me with my research project? Can I post a survey link on your site? I’m writing a paper about PatientsLikeMe and would like to cite some sources about you. How should I proceed? How representative is your data and where does it come from? What are the advantages of PatientsLikeMe as a data source? What are the main limitations of PatientsLikeMe as a data source? How do you assure patient privacy? How do you respond to patient reports of adverse events? Is your site available in other languages? Our research depends on answers from other patients like you, so the questions we are best at answering are ones that patients can help us answer directly. This includes surveys, developing patient-reported outcome (PRO) surveys, polls, multi-step surveys, and projects using other sources of data such as wearables. We can also do research on the data patients enter into their profiles over time (longitudinal studies). Our research can be funded in different ways - client (commercial), grant-funded, or internal research projects. Client work is typically with pharmaceutical companies and involves using our existing data as well as collecting new data through surveys to help clients make decisions and learn more about conditions experienced by our patients. A typical study might involve looking at the impact of a particular symptom (e.g., insomnia) in a given population (e.g., Parkinson’s disease). Grant-funded work takes place with collaborators at universities and academic medical centers who have written us into a grant as a subcontractor to collaborate in studies, sitting on advisory or steering committees, analyzing our databases, or conducting surveys. Internally, our team may choose to conduct their own research based on patient interests, personal interests, or with a view to improving and expanding the site. Being a member and updating your profile with symptom and treatment data is a simple way to contribute to the research constantly going on at PatientsLikeMe. Occasionally, we invite members to complete surveys about different topics related to a condition, symptom, or treatment. If your profile information tells us that you have a condition, symptom, or treatment that is part of a study, and you have been active on the site recently, you may get an invitation to a survey through the PatientsLikeMe private message system. Sometimes we also look for patients for other research opportunities and will reach out to people with the Research interest tag or who have been active in our Research Forum. That’s what our Research Forum is for! If you have a research idea please tell us more: What condition are you interested in? What is your research question (what is it that you want answered)? How can patients like yourself help answer that question? Remember, our research depends on answers from other patients like you, so the questions we are best at answering are ones that patients can help us answer directly. Many researchers are interested in understanding the patient experience on PLM. In order to maintain the integrity of the site, researchers place a request, then we check researcher credentials (affiliation, research record, publications) and then respond with approval or rejection. We recommend that researchers follow this route, and NOT register as a “patient” to avoid adding false data. Once approved, a researcher can navigate the site and view more patient data than simply visiting the site without logging in. This approval does not confer any access to patients' data or allow a researcher to post recruitment messages for studies. Please note that under our terms of service, you are not permitted to capture or utilize data from within the site nor to solicit members through our forums or private message to take part in your study. We are always interested in learning about innovative collaborations. If you have a well-defined line of research questioning and have a funding source (such as a grant mechanism or commercial source) identified, you can reach out to our research team here. Unfortunately, in only rare circumstances do we have resources available to help researchers define their projects, write grants, or develop protocols. We do not participate in studies in which we simply provide data to researchers. We prefer to be active collaborators in the implementation of the research protocols for which patient data will be analyzed. When we do share data, it is under a data sharing agreement with an institution or company. We do not participate in studies in which we simply post links to studies or recruit participants for outside parties. We prefer to be active collaborators in the implementation of the research protocols for any projects that we ask for patient participation. This typically occurs under a subcontract. If you have a well-defined line of research questioning and have a funding source (such as a grant mechanism or commercial source) identified, you can reach out to our research team here. Many of our measures are licensed under Creative Commons Sharealike, meaning they are free for use. The only restriction is that if you make any derivative works (such as a translation), these must also be licensed Creative Commons (i.e., you could not charge a fee for an Arabic language translation to other parties). Please let us know which specific measure you are interested in using by contacting our research team. We seldom participate in student projects. Due to the high volume of requests we receive each week, we are unable to discuss or evaluate the value of many potentially interesting student research projects or investigations. Please note that under our terms of service, you are not permitted to capture or utilize data from within the site nor to solicit members through our forums or private message to take part in your study. Can I post a survey or study link on your site? We seldom post links for student research projects. Unfortunately, due to the high volume of requests that we receive each week and the large number of internal surveys and studies that are being conducted, we are unable to post external links. Please note that under our terms of service, you are not permitted to capture or utilize data from within the site nor to solicit members through our forums or private message to take part in your study. Can I post research questions in your forums? We seldom allow research postings by students in our forums. We simply receive too many requests to process and don’t have the resources to review all requests. Please note that under our terms of service, you are not permitted to capture or utilize data from within the site nor to solicit members through our forums or private message to take part in your study. 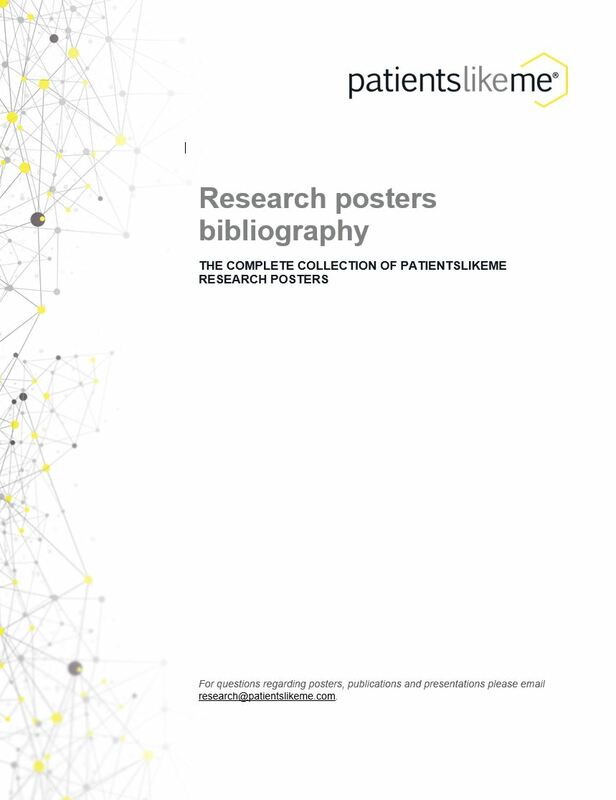 Please see our Chronological Bibliography for research published by PatientsLikeMe authors. In addition to our research page and the research section of our blog, you might like to try Google Scholar to read some examples of studies that have referred to us. We ask that you please email us to let us know about the citation once your study is published. To arrange to speak with one of our research scientists for your paper, please contact our media relations team. Every data source carries positives and negative aspects that help to answer the research question at hand. PatientsLikeMe data is based on patients who choose to participate in our site and is derived primarily from self-reports. We are working to include data from other sources in the future, e.g., genomics, electronic medical records, wearables, and other data sources. As with all of our current data, patients can choose to contribute as much or as little data as they like. Our users tend to be slightly more likely to be female, are a few years younger, a few percentage points more likely to be white, and a few percentage points more likely to have a higher level of education than the general population. We have more data and more patient activity in some conditions (e.g., MS) than in others (e.g., psoriasis). We have relatively few seniors (aged 75+) using the site, which may relate to familiarity with or access to technology. Conditions in which patients rapidly lose cognitive function may also make interaction difficult given the reliance on usernames, passwords and complex medical information. In a few conditions, such as fibromyalgia or IPF, our communities are so much larger than the few systematic studies that it is very hard to tell whether our biases are meaningful. We also work to minimize these biases and in larger communities can control for them by over-sampling those subsets of the community where we are under-represented and under-sampling those where we are over-represented. Drug Safety activities are an important part of monitoring the use and effect of prescription and over-the-counter drugs. As part of the drug safety efforts at PatientsLikeMe, we collect, monitor, research, and evaluate information about the side effects associated with medications used by our members. By sharing adverse event experiences through a side-effect survey, patients help researchers, drug makers and, most importantly, patients like themselves. Data collected from certain side-effect surveys and treatment evaluations are processed by our Drug Safety team and may be reported to manufacturers or regulators, such as the FDA. Currently, the website is only available in English, with most users reporting their location in the United States, with smaller numbers in Canada, the United Kingdom, Australia, New Zealand, and Scandinavian countries where people speak English as a second language. 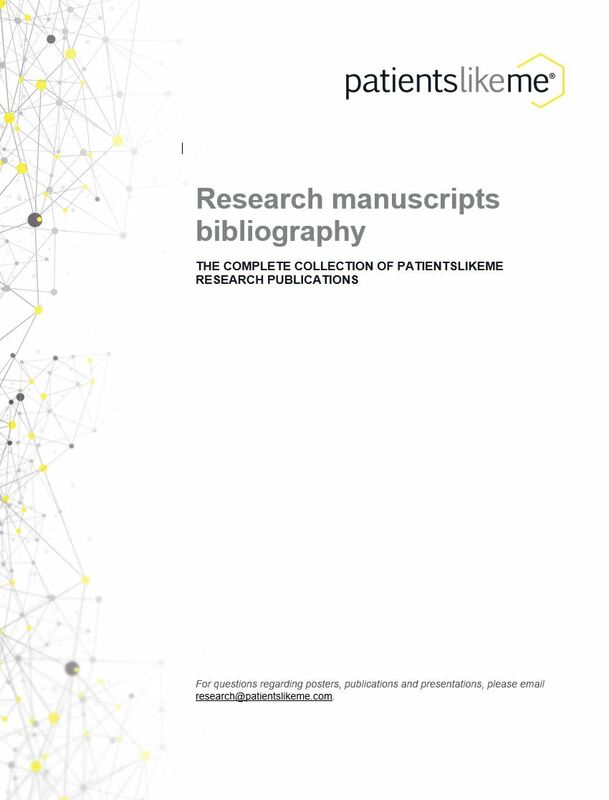 Interested in how research with PatientsLikeMe contributes to scholarly literature?